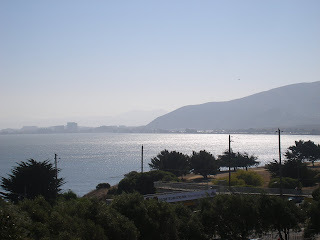 Candlestick Park from tailgate central. Let me start off by saying that I'm not at all a football fan. 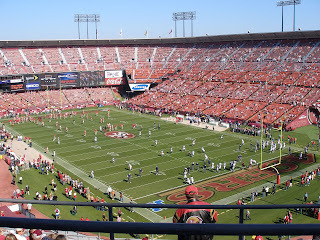 However, I have been to two San Francisco 49er games. Let's just say that I haven't been a good luck charm for the 49ers (although I'm sure I'm not wholly to blame) as they lost both games I attended. Both times I went to the game it was a special event game, alumni day, I believe. Where old 49ers came out in pregame ceremonies. 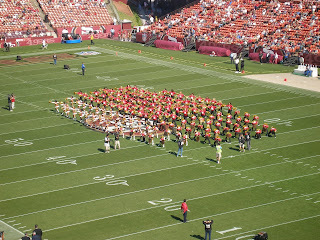 The game I attended this past October had past members of the Gold Rush, the 49er's cheerleaders, performing to music from their decade. The Gold Rush perform before the game. 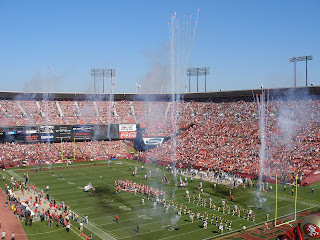 The 49ers currently play at Candlestick Park (originally built as the home of the San Francisco Giants major league baseball team); the stadium has gone through several name changes due to commercial sponsorship, but has now reverted back to the original name chosen by fans in 1959. 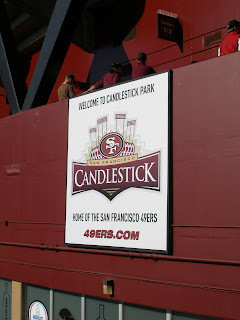 Candlestick Park has a rich history, including being the place where the Beatles played their last live concert in 1966. 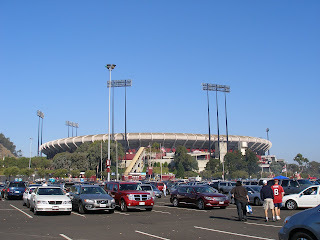 Currently, the San Francisco 49ers are looking to build a new stadium in the City of Santa Clara. Before the game you can tailgate in the parking lot. This is quite an amazing experience as some of the fans have very elaborate tailgating set-ups. People hang out, eat, drink, and play games before heading into the stadium for the game. The parking lot afterward is a sea of trash and smoldering coals left over from the tailgaters. The fans rush to get out of the parking lot as fast as they can, but there are lots of cars and few ways out...so traffic gets snarled. If you don't care about the end of the game, then I recommend leaving early. I also recommend taking public transportation, if possible.